B 1. Describe how light absorption and reflection allow one to see the shapes and colors of objects. B 2. Describe the structure and function of the human senses and the signals they perceive. GRADE-LEVEL CONCEPT: u The sense organs perceive stimuli from the environment and send signals to the brain through the nervous system. 1. Animals have sense organs that are structured to gather information about their environment. Information perceived by the senses allows animals to find food, water, mates and protection. 2. Each sense organ perceives specific kinds of stimuli. Some human senses are more or less developed than the senses of other animals. 3. Sense organs transfer information through a network of nerves to the brain where it is interpreted and responded to. The brain responds by sending messages to all parts of the body. The type of response and the amount of time it takes for the response to occur vary depending on the stimulus. 4. The human ear is structured to collect sound vibrations from the environment and pass them through the middle ear (eardrum and small bones) and inner ear (hair-lined tubes) to the auditory nerve where they are transformed into electrical signals that are sent to different parts of the brain. 5. The human eye is structured to collect light through the cornea and the pupil. The amount of light that enters the eye is controlled by the iris. The cornea and the lens refract the light and focus it onto the retina and the optic nerve where it is transformed into electrical signals that are sent to different parts of the brain. 6. For anything to be visible, light must be present. For a person to see an object, the light it reflects or produces must have a straight, unobstructed path to the eye. 7. Human eyes have receptors for perceiving shades of red, orange, yellow, green, blue, indigo and violet. 8. Sunlight (or “white light”) is a combination of colors. White light passed through prisms, water droplets or diffraction gratings can be refracted to show its component colors: red, orange, yellow, green, blue, indigo and violet. 9. The perceived color of an object depends on the color of the light illuminating it and the way the light interacts with the object. The color humans see is the color that is reflected by the object. For example, an object that appears green is absorbing all colors except green, which is reflected to the eye. 10. Human skin is structured to detect information related to texture, temperature, pressure and vibration. Each sensation has different receptors distributed around the body; some areas of the body have greater concentrations of receptors for certain sensations, making those areas more sensitive than others to texture, temperature, or pressure. 11. Human noses are structured to collect and detect chemicals floating in the air (odors). Tiny hairs behind the nose have special receptors that respond to airborne chemicals and produce electrical signals that are transmitted to different parts of the brain by the olfactory nerve. 12. Human tongues are sense organs that are structured for detecting chemicals dissolved in saliva (flavors). Taste buds respond to 4 basic tastes: salty, sweet, sour and bitter. Special receptors in taste buds respond to tastes and produce electrical signals that transmit information through nerves to different parts of the brain. Structure and Function -How are organisms structured to ensure efficiency and survival? · The sense organs perceive stimuli from the environment and send signals to the brain through the nervous system. senses and signals they perceive. Inquiry: In this inquiry, students will explore human sense organs and how access to different stimuli in our environment enables an individual to respond with more accuracy. Explain the activity and ask the students to make predictions in their journal. Place students in groups of four and give each student a copy of Handout A, Data Table. Each group of four students will receive the set of 4 paper bags containing the samples. Ask each group member to take one of the bags and note what letter is written on it. It is important that they do not look in the bag at this time. Ask each student to feel the content of their paper bag without looking and record what they think is the unknown material. The volunteers are not to taste what is in the bag, and they are not to say aloud what they think it is. Have the students rotate their paper bag to the student at their right. Repeat step 6 and continue until each student has had a chance to guess the identity of all four substances using only the sense of touch. The students should now pass the bags around a second time, now using sight to guess the identity of the substances. Finally, circulate the bags allowing the students to use all other senses to identify the substances. If they suggest tasting, assure them that none of the substances is harmful to taste. When students have completed this last observation and recorded their guesses, provide them with the correct identity of each of the substances. Students should summarize the data in a graph for each of the unknowns. The x-axis will be the senses used and the y-axis will be the number of students that made the correct prediction of the substances identity. · What sense do you predict will most helpful in allowing you to identify the sample? least helpful? · How accurate were the responses from the sense of touch alone? From the sense of sight alone? From a combination of these, and possibly with help from the sense of taste? · How do the senses depend on each other? · How do all five senses help us to know what is happening around us? (Optional) Watch “Schoolhouse Rock: Telegraph Line” on the internet. The video is presently available at http://video.google.com/videoplay?docid=-6088150380611957379. The video can easily be found with a Google Video search. “Neuro” means relating to the nervous system. People who study the nervous system are called neuroscientists. The brain performs all of its functions by receiving and sending signals through a network of fibers called nerves. Nerves are bundles of special cells called neurons. There are about 100 billion neurons in our bodies. They transmit signals just like electricity is transmitted through a wire. For example, if you stubbed your toe, a sensory neuron in your toe would send a signal to your Central Nervous System to inform it what has happened. You would perceive the signal as pain. Neurons also send signals within the brain. 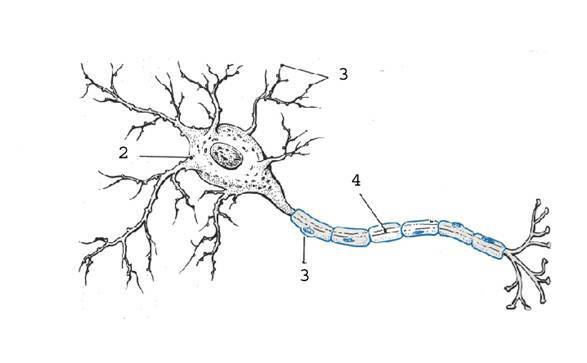 Inquiry: In this inquiry, students will explore the structure and function of neurons to gain an understanding on how information travels in the nervous system. They will use their knowledge to model information flow from the reception of a stimulus and the following response. 1. Students complete Handout A. Students can use Handout B to quiz themselves. I received the signal at my dendrites. The information travels along my cell body and along my axon. · The information travels across the gap toward the next cell. 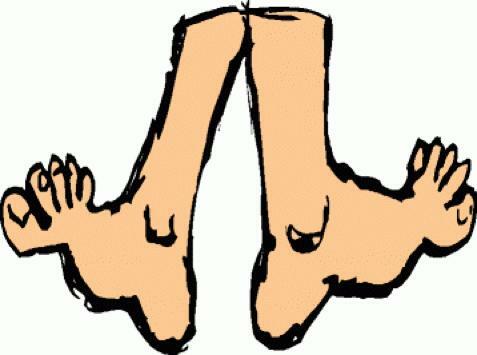 · What is the pathway of information to withdraw your foot or hand from danger? · How does the brain receive information from the environment? Tell students to think of other scenarios that involve their sensory organs sending information to their brains. · What are possible results of nerve damage? · Diagram information flow for receiving and responding to something you detected with a sense organ. 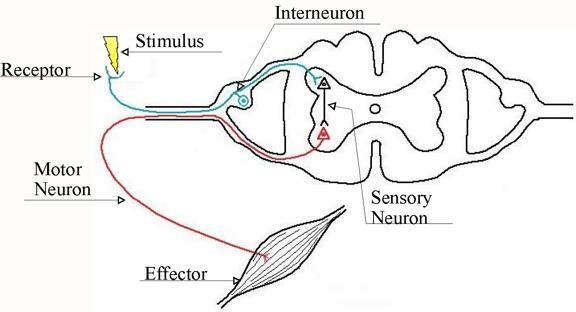 Science Concept: Information flows in a single direction in our nervous system: receptor → sensory neuron → neuron in the CNS → motor neuron → effector (e.g., muscle). This internal means of communication allows an organism to respond to its environment. If access to the internet is not available then the teacher can print the transcript for the video. Last accessed July 14, 2007. Neuron: A specialized cell that can receive signals and transmit them to other neurons or muscle cells. 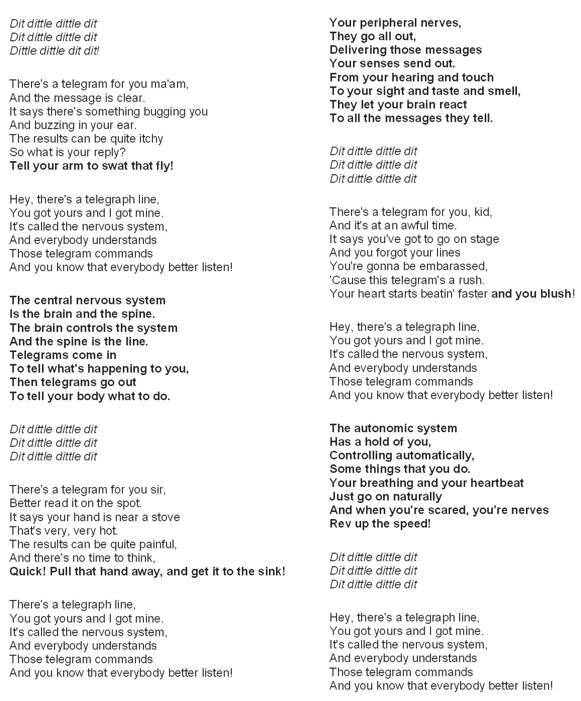 Peripheral nervous system: The part of the nervous system that includes sensory and motor nerves that branch from the central nervous system to the rest of the body. 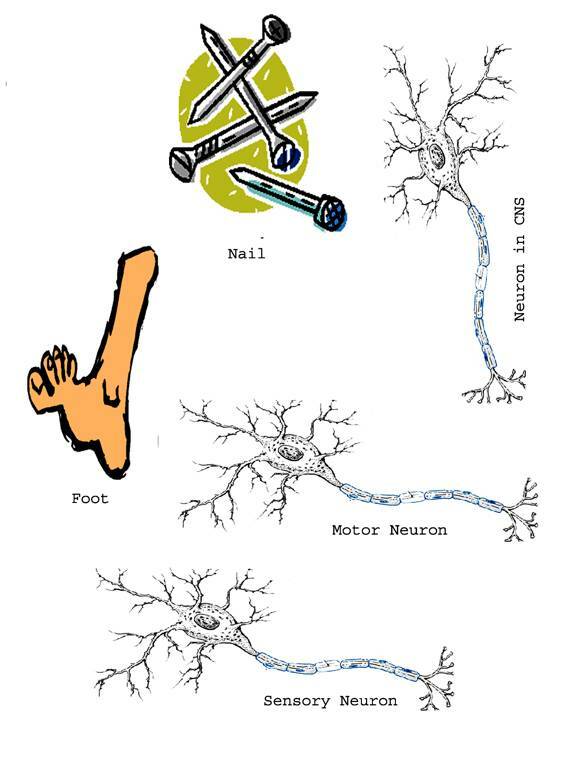 Cell body: This is the control center of the neuron. Many branches extend from the cell body to receive signals. 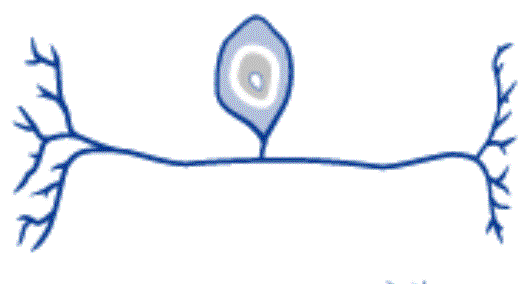 Dendrites: signal input region of a neuron. Sensory nerve: Nerves that react to external stimuli and send signals to the brain. Motor nerve: Nerves that send signals from the brain to the muscles to make them move. 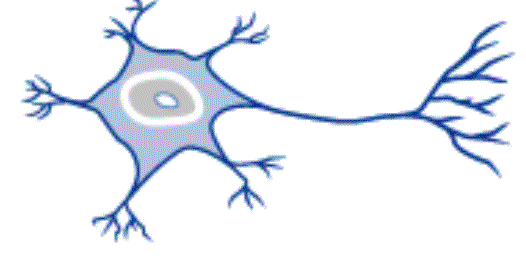 The neuron receives a signal from the brain or another neuron through the dendrites. The signal then travels to the cell body which is the control center of the neuron. A signal then travels along the axon, which is like a trunk. 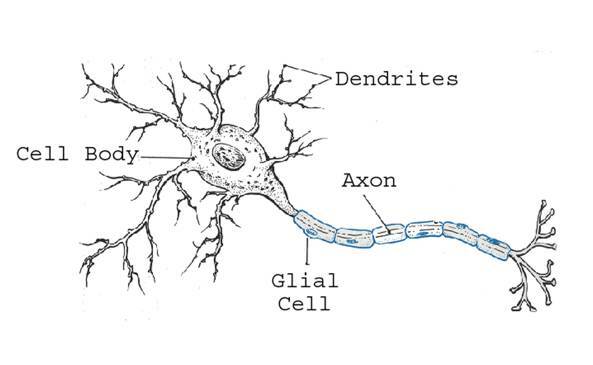 Glial cells, are fat containing cells on the axon, which increase the speed that a signal can travel down the axon. or in another type of cell (e.g., muscle). There are tiny gaps after every neuron. Signals must travel across these gaps to another neuron or muscle. Information travels in a one-way direction and move at speeds up to 268 miles per an hour. Directions: Use the labeled figure above to fill in the blanks below. A neuron receives information at the ______________. Information moves down these branched structures toward the ______________. The information may then travel down the _______________, a long trunk like structure which branches at its end. This trunk may be covered with fat filled cells called ______________, which increase the speed which a signal can travel. 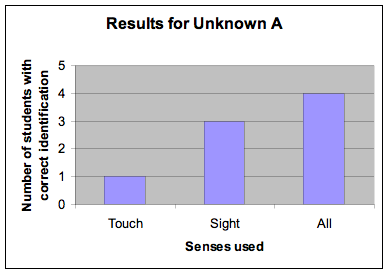 human senses and signals they perceive. Inquiry: In this inquiry, students will explore the anatomy of human sense organs and how specialized structures in these organs can detect stimuli and bring about a response. Students will be assigned to one of five groups. Each group will be assigned one of the human senses. Each group will research their assigned sense using resource like the Fact Sheet, Internet, library, etc. 1. What structures are unique to your individual sense organs? 2. How do these structures allow the particular sense organ to detect a stimulus? 3. What type of stimulus are these structures capable of detecting? Each group will present their findings orally. Students will work to complete their flipbook by adding information on the other four sense organs, as it is presented by the other groups. What structures are unique to your individual sense organs? How do these structures allow the particular sense organ to detect a stimulus? What type of stimulus are these structures capable of detecting? How does the body’s response to a stimulus relate to our information flow model from the previous lesson? Science Concept: Sense organs are specialized to detect different types of stimuli that an organism will encounter in their environment. Coordinated responses to varied types stimulus can increase an organism’s ability to survive. Inquiry: In this inquiry, students will explore the anatomy of human eye and how specialized structures in this organ respond to different intensities of light. In classroom light, have each student take turns looking into his or her partner's eyes in order to observe the partner's pupil size. 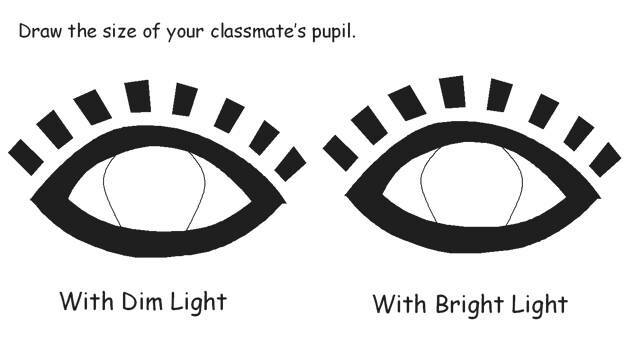 Have each student draw the partner's pupil size on Handout A for "with Dim Lights." Explain that again each student will look into his or her partner's eyes in order to observe pupil size, this time in dim light with a penlight or small flashlight. The viewing time, however, will be limited to a 1-2-3 count. On the count of 3, students are to turn off their lights and again record their observations in their Handout A for "with Bright Lights." Working with their partners, have students compare and note pupil sizes between drawings 1 and 2. Ask them to discuss what they think made the difference in the size of the pupils they observed and drew for each exercise. Pairs of students are given a copy Handout B to complete. Each student will be given a copy of Handout C to quiz themselves on eye anatomy. Explain/discuss the following encounter with light, entering a dark movie theater on a sunny day, and then leaving the theater to return to the bright sun. What causes the pupil of the eye to grow smaller? What causes the pupil of the eye to grow larger? What is the benefit of having a structure that responds to the intensity of light? Discuss with students the types of light that can be harmful to the human eye without proper protection such as laser or sunlight. Science Concept: The eye is capable of responding to various intensities of light. This capability allows us to perceive objects across a broad range of light conditions (e.g., night, day, overcast, etc.) by controlling how much light enters the eye. Parts of this lesson were adapted from “Lights, Camera, Action!” at Institute of Atmospheric Sciences. http://www.ias.sdsmt.edu/RSEL/Outreach/ESC/ESC_CD/LESSONS/LIGHTS_CAMERA_ACTION/LESSON_PLAN.HTM Last accessed July 16, 2007.
http://www.scienceteacher.org/k12resources/lessons/lesson10.htm Last accessed July 16, 2007. The human eye is a remarkable organ that, through the sense of light, allows us to learn more about our surrounding environment. Through the iris (colored part of the eye that control the size of the pupil through the contraction of muscles) and the pupil (the black circle that controls the amount of light entering the eye), the amount of light entering the eye is regulated. 1. What did you observe happen to your partners eyes? 2. What part(s) of your partner’s eye caused the change you observed? 3. Explain why your partner’s eyes responded differently to the two levels of light. The front of the eye is protected by a clear layer called the ______________. When you look at someone’s eyes, you will see a colored part called the ______________. 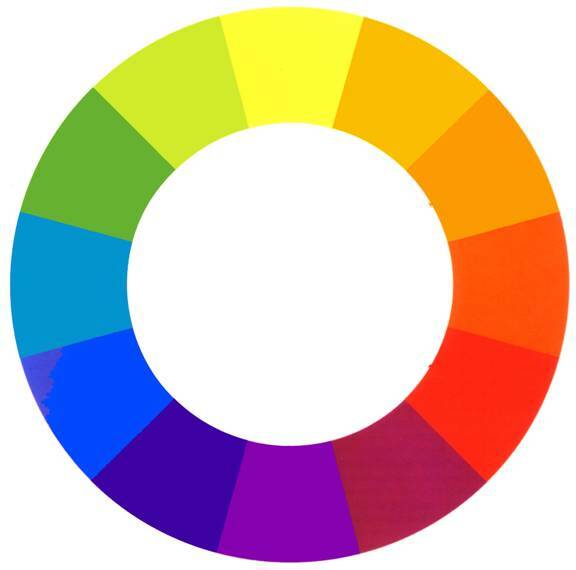 In the middle of this colored part is a black opening that allows light into the eye; it is called the ______________. The ______________ is held by muscles and focuses light on the back of the eye. The back of the eye is called the ______________. Signals from the eye go to the brain through the ______________. 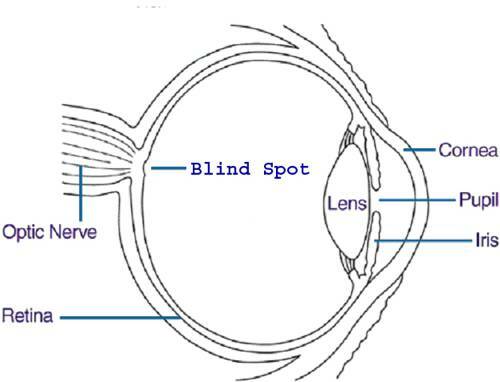 At the back of the eye is a place where there is o room for receptors called cones and rods. This place is called the ______________. u The sense organs perceive stimuli from the environment and send signals to the brain through the nervous system. Transfer and Transformations -What is the role of energy in our world? 5.1 – Light is a form of energy. u Light is a form of energy that travels in a straight line and can be reflected by a mirror, refracted by a lens, or absorbed by objects. · Items intermediate to the primaries (e.g., secondaries). Inquiry: In this inquiry, students will begin to explore properties of light. They will discover that light energy varies and that this variation allows us to perceive the color of an object. 1. Have student form groups of 4 - 5 individuals. 2. Give each group a color wheel and packet of colored filters. 3. Remind them of the information reported on light receptors by the group that researched eyes or if this information was not covered then explain to the students how there are 3 types of color receptors in our eyes. 4. Give each group an item whose color is not a primary color. 5. Each group will formulate an explanation for their perception of the color of the object they were assigned. 6. Each group will then report their findings to the class. 1. Are the various colored objects around us light sources? Explain. 2. If receptors in our eyes respond to light stimuli then how could the objects not be light sources? 3. Why would an object appear black? white? 4. Why refer to the complete visible spectrum as white light?. 5. Why do we perceive the objects around us as being different in color? 6. If we only have three types of color receptors in our eye then how can we perceive colors so many colors (e.g., 64 box of crayons). Science Concept: The color of an object is perceived by which colors of the visible spectrum hit our retina. Light that is not absorbed or transmitted by an object is reflected. This reflected light stimulates the receptors of the eye and then our brain decodes this information. The color we perceive is dependent on the degree that the individual types of receptors on the retina are stimulated. 13. Animals have sense organs that are structured to gather information about their environment. Information perceived by the senses allows animals to find food, water, mates and protection. 14. Each sense organ perceives specific kinds of stimuli. Some human senses are more or less developed than the senses of other animals. 15. Sense organs transfer information through a network of nerves to the brain where it is interpreted and responded to. The brain responds by sending messages to all parts of the body. The type of response and the amount of time it takes for the response to occur vary depending on the stimulus. 16. The human ear is structured to collect sound vibrations from the environment and pass them through the middle ear (eardrum and small bones) and inner ear (hair-lined tubes) to the auditory nerve where they are transformed into electrical signals that are sent to different parts of the brain. 17. 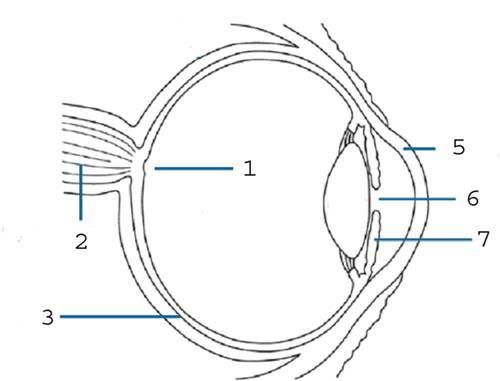 The human eye is structured to collect light through the cornea and the pupil. The amount of light that enters the eye is controlled by the iris. The cornea and the lens refract the light and focus it onto the retina and the optic nerve where it is transformed into electrical signals that are sent to different parts of the brain. 18. For anything to be visible, light must be present. For a person to see an object, the light it reflects or produces must have a straight, unobstructed path to the eye. 19. Human eyes have receptors for perceiving shades of red, orange, yellow, green, blue, indigo and violet. 20. Sunlight (or “white light”) is a combination of colors. White light passed through prisms, water droplets or diffraction gratings can be refracted to show its component colors: red, orange, yellow, green, blue, indigo and violet. 21. The perceived color of an object depends on the color of the light illuminating it and the way the light interacts with the object. The color humans see is the color that is reflected by the object. For example, an object that appears green is absorbing all colors except green, which is reflected to the eye. 22. Human skin is structured to detect information related to texture, temperature, pressure and vibration. Each sensation has different receptors distributed around the body; some areas of the body have greater concentrations of receptors for certain sensations, making those areas more sensitive than others to texture, temperature, or pressure. 23. Human noses are structured to collect and detect chemicals floating in the air (odors). Tiny hairs behind the nose have special receptors that respond to airborne chemicals and produce electrical signals that are transmitted to different parts of the brain by the olfactory nerve. 24. Human tongues are sense organs that are structured for detecting chemicals dissolved in saliva (flavors). Taste buds respond to 4 basic tastes: salty, sweet, sour and bitter. Special receptors in taste buds respond to tastes and produce electrical signals that transmit information through nerves to different parts of the brain. Science Concept: Information flows in a single direction in our nervous system: Receptor → sensory neuron → neuron in the CNS → motor neuron → effector (e.g., muscle or gland). This internal means of communication allows an organism to respond to its environment. 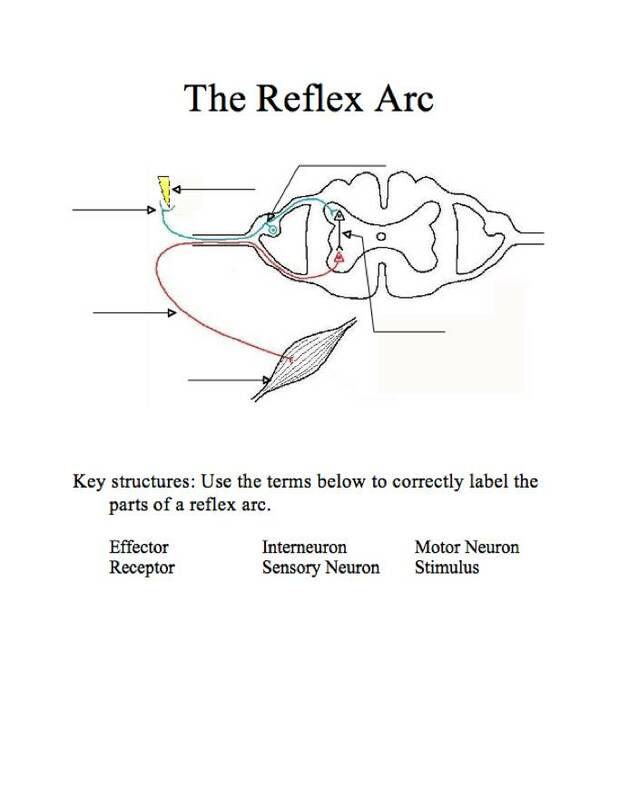 The Reflex arc is the simplest demonstration of communication. Reflex actions are involved in most of our self-correcting actions. A brief introduction should be given describing the idea of a reflex and the basic types of neurons. Alternatively, this could be given as a pre-class reading assignment. Place the students in pairs and have them perform two or three of the reflex tests noted below. Teachers should choose the test that they feel will work best with their class. As they work, students should record the stimulus, receptor (or receptor organ), effector and action for each test. It might be good to have them modify the drawing above for each of the reflexes. § This reflex is one that is always active, but seldom noticed. Once a person begins swallowing (moving material to the back of the oral cavity) the reflex takes over and it is nearly impossible to stop. In addition, without material in your mouth to swallow the reflex does not occur. § Students should be told to swallow the saliva in their mouths and immediately swallow again. Challenge them to swallow in as rapid succession as possible. They should note a delay. Then have them consider how fast they swallow when drinking a glass of water rapidly. § This reflex is simply the adjusting of pupil size to light intensity. § One member of each student pair should close their eyes for two minutes. When the two minutes is up, the other student should examine the first student’s pupils as he/she open their eyes while facing a bright light or window. An alternative method is to have the partner shine a flashlight into the first student’s eyes to see the change in pupil size. § Repeat the process with the students switching roles. § Describe the response with scientific terminology. § Questions: What is the purpose of the photo-pupil reflex? How quickly does the reflex occur? § In moderate light, the first student should focus on an object across the room (20 feet or more is best) while the second student examines their pupils. § Then they should switch to a pencil 6 to 12 inches in front of their face and the partner should note the pupils’ reaction. § The students take turns noting the change in position of the eyeballs while focusing on a pencil at various distances. § The student starts by focusing on a pencil about 3 feet away. § While observing the first student’s eyeballs, the partner brings the pencil slowly closer, until it is just in front of the subject’s nose. § This is the knee jerk response. It is detecting a change in the shape and tension in the muscle and compensating. § The student must sit with legs hanging freely, while their partner strikes the ligament just below the knee cap. § This works better if the subject is distracted. These reflex responses can then be compared to the reaction time embedded task. How does process of reacting differ from reflex? The sense organs are each highly specialized for their specific roles. These activities will allow students to explore the organs’ function and organization. It would be most effective if the flip book activity can be used as a language arts module in combination with this exercise. The eyes and sight are given individual coverage in other lessons so this will focus on hearing, touch, smell and taste. Describe the basic property of sound as vibration. The ear detects sound as well as its patterns and intensities. The frequency creates our perception of pitch. While the amplitude of the wave dictates how loud it is. Question students about how well they hear. How does the average person hear compared to some other animals? What differences do they know of between the ears on these animals and people? Have the first student sit with their back to the wall or board. Their partner will hold a retractable (click) pen next to their right ear, so that the subject can hear it being clicked. While clicking the pen at regular intervals, the pen should be moved slowly away from the subject’s ear (along the wall) until the clicking can no longer be heard. Mark the point and measure the distance from the student’s ear to the point where the sound was lost. Repeat with the second ear, and then have the students switch roles. This activity can be extended by having the subject sit with eyes closed while the partner moves the pen to points around the student and the student tries to determine the location. This will introduce a second role of hearing. Students are provided with cups containing a variety of compounds to discriminate their sense of smell. Suggestions include coffee, garlic, and cinnamon. In groups of four students they should pass the cups around and try to identify the scents. Record which spice samples they observed and their responses. The tongue (and the nose for that mater) detects chemicals as flavors. The receptors for these flavors are detected by taste buds. When the students examine their tongues or their partner’s, they will commonly observe the little mushroom shaped bumps on the tongue. These are known as papillae. The common misperception is that they are the taste buds. In reality the taste buds are much smaller and are in the trenches around the papillae. The receptors of the taste buds detect four major chemical types as salty, sour, sweet and bitter. Each of these tastes is recognized by a specific set of taste buds. Students can explore the organization taste buds. The group should have a simple diagram of a tongue. Provide them with Q-tips and tubes with small samples of sugar water (sweet), salt-water (salty), lemon juice or vinegar (sour), and tonic water (bitter). They should carefully remove the Q-tip from each solution so that it is not dripping, and carefully touch it to different areas of the tongue (tip, sides near front, sides near back, middle of tongue, back of tongue, etc). Record on the diagram where each of the students tasted the individual materials. What were the common responses? Where there any areas of the tongue that didn’t taste anything? The skin is our largest organ and one of its main function is sensory reception. It detects pressure, temperature pain, and movement. In order to do this it has at least 3 different types of receptors. The ability to feel these stimuli depends on the location of the receptors, much like the tongue. Different parts of our bodies have differences in the number and type of receptors, depending on the function of that area. Working with partners the students should draw a 2 cm x 2 cm square on their palm and wrist. The square should then be divided into a 4x4 grid. 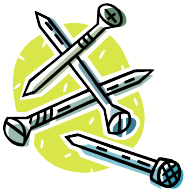 While the subject has their eyes closed the partner should lightly touch the center of each of the 16 different spots in the squares with the point of a long blunt finishing nail. In their notebooks students should have corresponding grids. If a sensation is felt a T should be recorded in the notebook grid. The procedure is repeated using finishing nails that have been placed on ice. With the head of the nail lightly touch the spots on the grids. Mark a C on the grid if the subject detects cold. Which area is more sensitive to touch? Which area is more sensitive to cold? What areas of your body would you expect to have more receptors for touch? Are there areas that might have fewer receptors for temperature? The eye detects color with cones which are part of the retina. The cones are receptors that detect the wavelength and intensity of the light that strikes them. Receptors detect specific ranges of light, and the combinations communicated to the brain are perceived as the various shades of color. One of the simplest ways to demonstrate the reception and perception of color is to have the students determine the complementary color from an afterimage. Students stare at colored cards for 30 seconds, then immediately look at a blank white paper. What is the color they see on the white paper? What do you think is happening that give the after image? The human eye acts similar to a cat’s eye, when it responds to light. Your friend has noticed that her cat is bumping into furniture. She thinks that her cat may be losing her eyesight. Explain how you could test the cat’s vision. Use at least two scientific terms in your response. Traffic lights are important signals. Explain how the eye can distinguish the colors (red, yellow, and green) in a traffic light. A green filter would absorb which of the following colors? You are icing a cake and you want to use green icing. You do not have any green food coloring left. Which two colors could you mix to make green?